Sunlight shines through our front door peephole this morning. 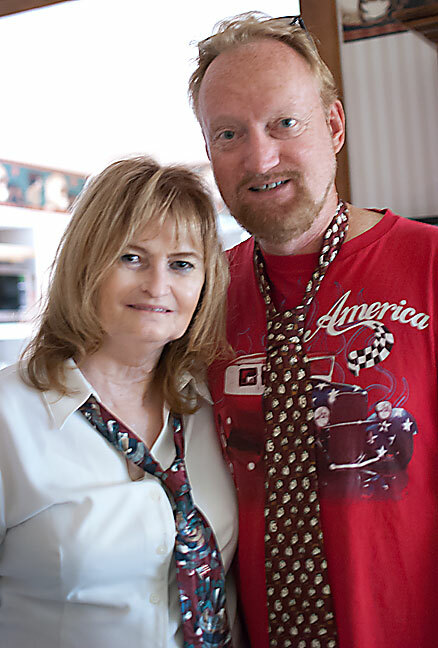 Abby and I wear our new 99¢ neckties this morning as she prepares to leave for a gambling weekend with her best friend. Summer ends soon. I know this not only by the calendar, but by a neat phenomenon in our house. 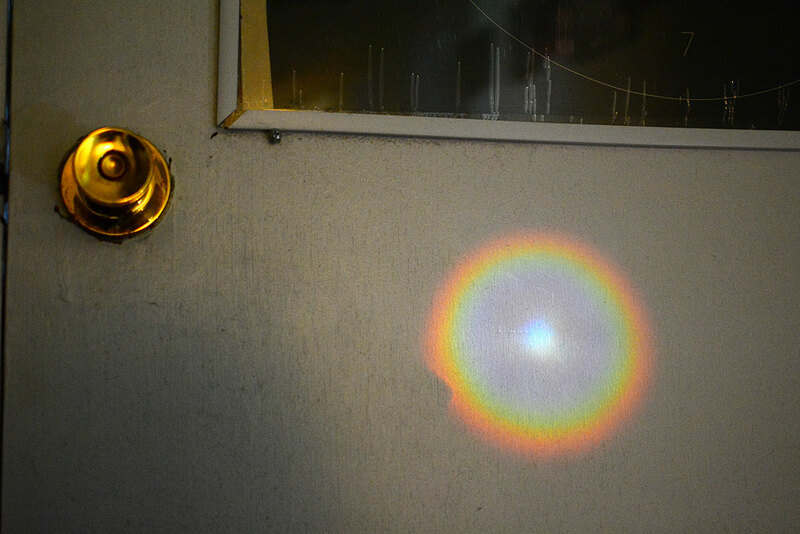 Since it faces directly east, as the vernal and autumnal equinoxes approach, morning sun comes in through our peephole and makes a rainbow dot on the inside of the back door, or anything else in its path. For this Labor Day weekend, Abby and her best friend are on one of their gambling junkets. In preparation for this, yesterday Abby asked me to go by the Goodwill to try to find some iteration of a U.S. flag necktie so she could assemble a patriotic outfit. I was only able to find a couple of halfway matches, which she said would work, then ordered two on Amazon for each of us for the next occasion. I also found a Fred Flintstone tie for myself at Goodwill. Once she had it all together, she looked pretty adorable, so we posed for her friend’s camera before she left. 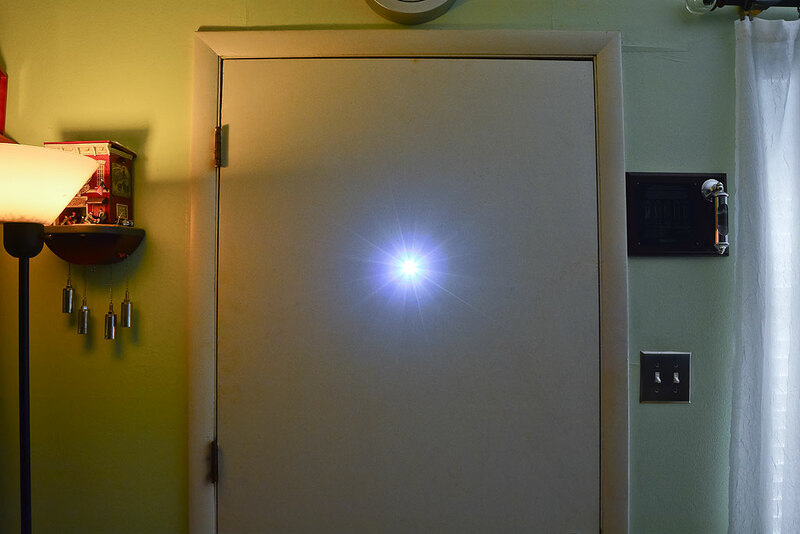 Light from our peephole shines all the way down the hall to the back door of our house this morning. Abby is rocking her hair game! Cute ties too. Our front door’s peephole does this too, just at a different time of year, because we’re not facing directly East. You’ve inspired me to document which day it happens, so I can have a “front door calendar” too. Wasn’t your great-great uncle buried in that Fred Flintstone tie? Yes, after he was killed in it.